I recently installed Inkscape. 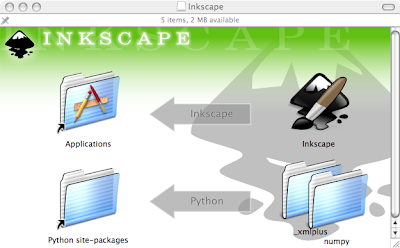 This was interesting for me because Inkscape is similar to OpenOffice.org on the Mac. It too needs X11 to run and has a special launcher to help integrate the program with the OS. They have the easy installation similar to what will be introduced in the next release of OpenOffice.org. What is more interesting is that on first start they have a message “Font caches may need to be updated”. This allow the user torun a program called fc-cache. I don’t know if this could be of any use in OpenOffice.org. As OpenOffice.org on the Mac has done various things to allow the support of fonts installed for Mac OS X applications to be used in OpenOffice.org too. Something that was even more interesting for me was the application that produced the Mac OS X integration. It seemed that they didn’t use a simple Applescript droplet. Instead they seem to have used an Applescript studio or XCode application and used Interface Builder to produce the application. One advantage is that way you don’t need to have a menu called “edit” with a menu item in it called “edit script”. This has confused a number of OpenOffice.org users before. This entry was posted in Download, Open Source, OpenOffice, Software on January 28, 2007 by smsm1986. OpenOffice.org for Mac OS X (X Windowing) has been released publicly. I updated the web pages earlier to day. It should be noted that there currently is no tested German version, as no one has tested it yet. I have made a number of other changes to the web pages that have been in the pipeline for quite some time now. This includes the introduction of the new home page for the Mac Port. Some other pages have been updated as well, to include the new border, which has been missing on some of the new pages. This entry was posted in Download, Mac Port, OpenOffice on October 13, 2006 by smsm1986. Ahead of the OpenOffice.org conference, I have just released the new download pages for OpenOffice.org (X11) on the Mac. They are now much simpler than before. The download is now available at http://porting.openoffice.org/mac/download/. The old download pages (except the legacy download for 1.1.2) redirect to the new pages. Part of this is the fact that there is no longer a big long list of mirrors to choose from. This is because I have used the OpenOffice download bouncer for all the downloads in the OpenOffice.org download servers. If anyone else needs to update the pages in the future, you will need to speak to cloph on IRC, who is able to update the bouncer with the new files. I’d like to thank Fipa for his design, and James McKenzie on the mac@porting.openoffice.org list for his feedback. There are more updates to come to the OpenOffice Mac Porting site before the end of the month, thereafter updates to the site will slow down. I’m waiting on fink compiling quanta, which is the editor that Fipa used to create the pages, so hopefully I’ll find it easier to keep the site up to date with the new design. I hope that it will be better than the more than a year old Nvu, even if I have to use X11. This entry was posted in Download, Mac Port, OpenOffice on September 9, 2006 by smsm1986.